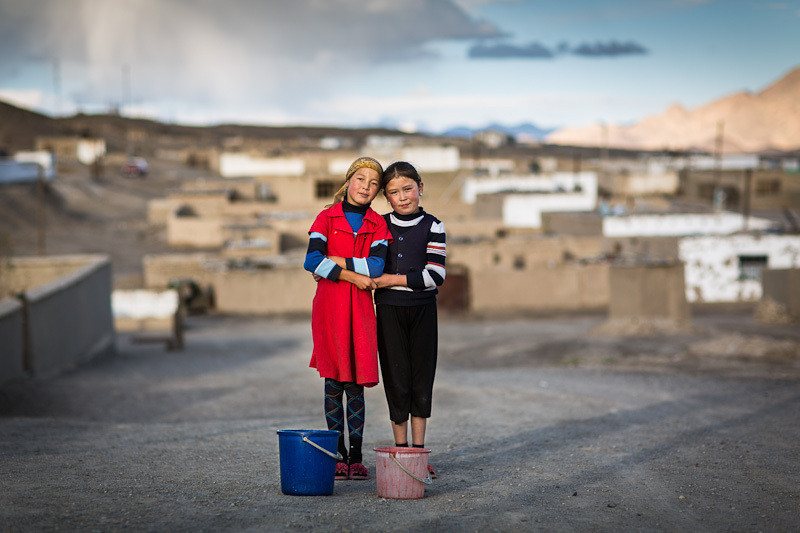 Two Kyrgyz girls standing in a street in Murgab, Tajikistan. They are standing with two buckets that they use to collect water from the local well. Like many other residents of Murgab (also spelled Murghab), their nationality is Kyrgyz, but their citizenship is Tajik. Murgab is more than 3,500m above sea level. In summer its landscapes can be places of stark beauty; in winter it is bitterly cold and is perhaps similarly beautiful. It is located along the Pamir Highway, which connects Kyrgyzstan to central Tajikistan, making it a popular destination for tourists traveling through Tajikistan from or to Kyrgyzstan. One of a kind work! Outstanding capture, love this DOF! "V"